Alternative country is a term that was popularised in the early 90’s. Although many will argue that what we describe as alt-country had been around for decades before. Let’s not start. Alternative Country, the rebel child of the mainstream commercial country music making machine is made by artists who wear their love of traditional country music like hearts on their sleeves with their cowboy boots standing firmly on the other side of the fence. You may even call it Americana. This is music that’s been thriving worldwide for some time and more importantly here in Australia. 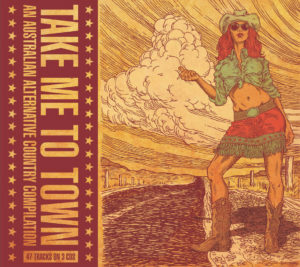 Take Me To Town is a compilation highlighting the fact that Australian alt-country is truly alive and kicking. An inspired idea from Stanley Records’ Dave Favour who set the wheels in motion, roping in two music loving compadres, Areatha Bryant of Mother Hen Touring and music journalist Chris Familton of Rhythms and Post To Wire. The trio nutted out a list of artists, and what a list, ending up with 47 impressive tracks over three discs, of which half are exclusive to this release and not a dud amongst them. New songs from Chris Altman, James Thomson & the Strange Pilgrims, Mick Daley Versus The Wayshegoes and A Man Called Stu, familiar names like Lachlan Bryan & The Wildes, Tracy McNeil & The Goodlife, The Weeping Willows, William Crighton and Jen Mize and so many I have just discovered. And isn’t that what this is all about, discovering new music alongside those who have paved the way. Although, there are many that didn’t make the list, you can only think there could be a Volume 2 one day. The traditions of country from honky tonk to bluegrass matched with rock and punk attitude is truly what this genre is all about and it’s here in bucket loads. Every song has it’s own interpretation of country which further illuminates what an amazing pool of talent we have right here on our own back porch. Slow country comforters to rollicking ragged rock, it’s all country and all Australian.